Olympia High School Prom 2018 will be held Saturday April 28, 2018 in the Prairie Ballroom at Illinois State University. Guests can park in the lot behind the student center and enter through the doors adjacent to the parking lot. Tickets will be on sale at the High School during Jr/Sr Lunch beginning April 16. Prom is an event for junior and senior students at Olympia and their guest. The doors open for pictures at the event at 7pm, the dance begins at 7:30 and will conclude at 10:30. All school rules apply. Be sure to buy tickets early as t-shirts are being purchased for all who attend After Prom. 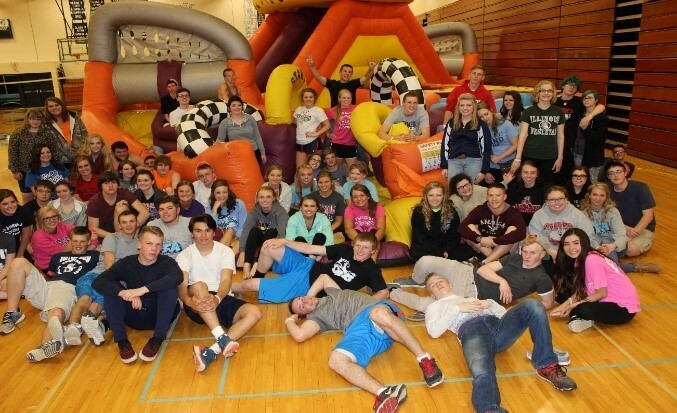 After Prom will be held at the high school and is currently being organized by the After Prom committee. We are still seeking door prize donations. If you are willing to donate or know a local business that would like to support our event please contact Angie Davis at 309-379-5911x9322. All guests attending Prom will be admitted to After Prom free of charge. Upperclassmen who do not attend Prom but are wishing to attend After Prom, should see Mrs. Davis for tickets and pay $10. Be sure to bring your tickets for admittance. All waivers must be returned to school prior to the event! Additional copies are available for print using the links below. Students must be checked in at the event by 11:30 pm and will stay at the lock in until dismissal at 4am. Guests will enjoy food, games, laser tag, mechanical bull, pool, hypnotist, music and much more! The committee is excited for the event! In addition to taking pictures at the Prom venue, Ewing Manor in Bloomington is available for photos prior to the dance. However, the Ames Library at Illinois Wesleyan University will be unavailable. Students are preparing for final exams and finishing off their research papers. Because of this, no indoor photos will be allowed. The campus welcomes photography outside buildings on the beautiful grounds.